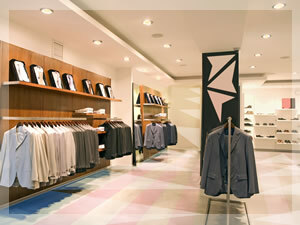 Apparel and Footwear retailers have several unique requirements including the size, width, color, material matrix. Each item has multiple inventory groups to accommodate the versatility of the fashion groups. With the growing competition within this vertical, many retailers are taking advantage of effective customer relationship management and loyalty solutions. The RDT item master and inventory management system is design to display information at all levels of the item master. The system allows you to group the items by size, color, material or any other grouping. The item matrix has up to 6 levels of distinction. This gives the apparel/footwear retailer more flexibility within their matrix configuration. The dynamic reports allow the back office user to create several views to perform in depth analysis. The data includes open to buy analysis, suggested replenishment based on several inventory methods, robust sales analysis and vendor analysis reports. RDT real-time connectivity gives the apparel/footwear retailer to maximize their stock position via inventory transfers, store to store send sales, and pay to pick up transactions. The RDT CRM and loyalty solutions give the apparel/footwear retailers the ability to increase customer sales volume and visits based on direct targeted marketing programs.